We caught up with LINES to discuss the band’s history, politics, and walking a changing line in Stockholm nightlife. High-octane vocal samples followed by a firm-footed dance beat propel you into LINES latest track, ‘People’. After a startling introduction, the chorus vocals cry out that “this is for the people we love” – but what of the people behind ‘People’? The origin of LINES traces back to a love affair with Europe’s techno capital, Berlin. After indulging in the German capital, three Swedes – Erik, Fred and Nisse – returned to their home region of Stockholm as a band under the banner of ‘IIIII’. The trio are among numerous acts harnessing eighties synth sounds with a modern flair; Massachusetts’ Boy Harsher being another artist occupying a similar niche. Since their “pilgrimage”, the three-piece have undergone changes in the band name and have signed to the large independent label 300. LINES solidified a musical presence in 2017 with two singles, ’You’ and ‘Weekends’. A club anthem swathed in the dark apparel of a Berghain denizen, ‘You’ proved to be particularly popular. The single has amassed six million streams on Spotify alone. 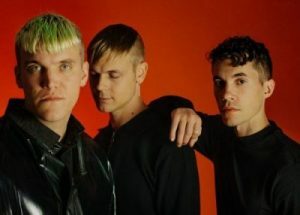 With a strong reception from their 2017 singles, LINES continued their synth-pop campaign into 2018. Much of this output would not have been possible without the creative freedom provided to them by their label. Erik praises 300 saying that they “don’t necessarily put on the pressure that everything has to do really well”. He references their most politically motivated track as an example. Featuring Swedish rockers Dolores Haze, ‘We Will Never Rule the World’ was allegedly the result of the two bands plotting to depose the Swedish monarchy; a partnership that was perhaps best forged in music and not in treason. In addition to the band’s current set of dark dance tracks, the trio appears to be concerned with LINES visual output. Down to a necessity to take a DIY approach, Erik, along with videographer Giannina Panfichi, directed videos for the tracks ‘You’ and ‘Lockdown’. “We could never have done [the music videos] with the budgets we have if we had to pay directors and editors” Erik comments. In both ‘You’ and ‘Lockdown’ the videos feel like separate creative endeavours to the songs. This seems to be something intentional. Fred comments that “[in] the videos we’ve done we make the song first and then attack the song again with new eyes”. Although LINES continue to gain musical traction and popularity, this is not without becoming aware of changes in Stockholm nightlife. Across Europe, it is well established that nightlife is suffering. In London, the Mayoral office has even created a new ‘Night Czar’ position to help tackle this issue. Due to a combination of government crackdowns and the effects of gentrification, venues and clubs across Europe’s cities are being closed down or have to abide by stricter curfews and laws. Stockholm is no exception. LINES are set to release a three track EP of new material in early 2019. Until then you can check out their latest track ‘People’ below.